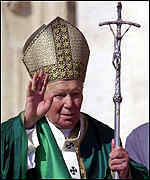 March 6, 2000, Rome - A leading conservative candidate to succeed Pope John Paul II has warned that the Antichrist foreseen in the Book of Revelations is already among us. Cardinal Giacomo Biffi, 71, said that the modern Antichrist, identified in the Book of Revelations as a seven-headed beast, was most likely now disguised as a philanthropist supporting creeds like vegetarianism, animal rights or pacifism, or advocating dialogue with Orthodox or Anglican believers. 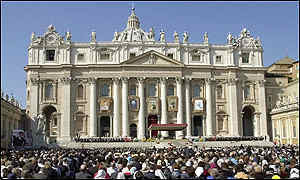 But his true aim was to undermine the Catholic church, the Cardinal argued. As Archbishop of Bologna, one of Italy's most populous and richest dioceses, Cardinal Biffi is a clear contender for the papacy, given that his fellow cardinals may well decide to select an Italian as successor to the present Pope, who is now 79, when he dies. However, Cardinal Biffi is also deeply conservative in his views and his remarks are likely to offend some progressive Catholics. He was speaking at a conference of academics in Bologna last weekend, on the 19th century Russian mystic Vladimir Solovyov, who predicted horror and disaster in the 20th century. The cardinal reminded those attending the conference that the 20th century had seen many massacres. As well as the killing of six million Jews in the Nazi holocaust, Cardinal Biffi mentioned the killing of millions of Armenians in Turkey and the victims of Stalin's purges in the former Soviet Union. 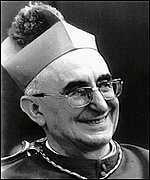 The cardinal said the 20th century had also witnessed what he called a selfish, unwise, sexual revolution and unparalleled vulgarity and shamelessness.